What’s Your Diet Type: Use the Power of Your Personality to Discover Your Best Way to Lose Weight was written by Heather K. Jones, a registered dietitian and weight loss counselor. It is based on the principles of personality typing and outlines how you can create a tailor-made diet and lifestyle plan that will work with your personal strengths as well as carefully manage your weaknesses. Jones highlights the fact that different strategies are needed for the different personality types and that as you learn more about your unique strengths and challenges you will gain a better understanding of how these factors affect your efforts to lose weight. Thrives on routine and when the unexpected happens they may eat to alleviate stress. Lives in the moment and doesn’t like rules. Prone to ‘opportunity eating’ such as in situations when free food is offered. Strives to improve themselves and very sensitive to others. May turn to food for comfort when disappointed or hurt. Requires a detailed understanding of their diet program. Can sometimes twist information so as to justify poor food choices. Each personality type is provided with a detailed program that includes strategies designed to help you overcome your potential trouble spots. A great deal of emphasis is placed on addressing the psychological factors that can potentially have a negative impact on successful weight loss. In the chapter for each personality type you are guided through the actions you need to take in order to achieve your weight loss goals, with the recommendations varying for each type. For example Diet Planners have a comprehensive five-step plan to follow. Diet Feelers learn to get in touch with their emotions and explore how this affects their food choices. Diet Thinkers are provided with tools to calculate dietary information as well as reading recommendations to continue to expand their knowledge. There is also a chapter at the end of What’s Your Diet Type that provides basic details that apply to every type regarding healthy dietary choices and exercise advice. Exercise is recommended because it helps you lose fat and maintain lean muscle mass. It also can boost your mood, build confidence, relieve stress and improve sleep quality. Twenty to sixty minutes of moderate aerobic exercise are advised for three to five days a week. Strength training should also be included at least twice a week during the What’s Your Diet Type. 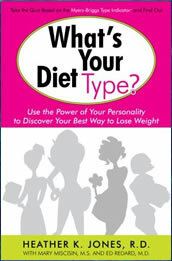 What’s Your Diet Type: Use the Power of Your Personality to Discover Your Best Way to Lose Weight retails at $19. Customized to suit the individual. Addresses the role psychological factors in weight management. No foods are strictly off-limits so long as portions are monitored. Provides a list of acceptable snacks and treats. Encourages the intake of low glycemic carbohydrates and healthy fats. Includes recipes with nutrition information. Teaches dieters how to monitor portions. Various activities will require time and motivation. Vegetarian meal suggestions are very limited. May take some time before results are apparent. What’s Your Diet Type will appeal to highly motivated dieters who are willing to put in the effort to undertake different activities and explore the various factors that may be influencing their attempts to lose weight. While it may take some time for results to occur it is most likely that the effects will be long-lasting because dieters will be addressing the unique core psychological issues that must be resolved in order to achieve successful weight loss. You can take a free diet type personality quiz here.